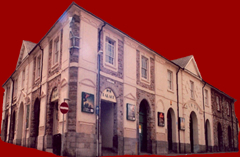 The Two Screen Palace Cinema, offers all the latest movies in comfortable surroundings on Big, Bright Screens. The Cinema is equipped with Sony Digital Cinema 4K for The Ultimate Cinema Experience. See whats on on the cinema’s own web site. Palace 1 is Fully Accessible with four wheelchair spaces. Phone 01437 76 76 75 option 1, then option 7 for wheelchair accessible performances. “The Palace is a step back in time when picture houses had style and glamour unlike the modern tin shed multiplex cinemas, which are sanitised, far too american for my liking and you need a mortgage to buy food and drink. The Palace is tired but it still has all the charm of days gone by and the staff are charmless but it provides an almost Fawlty Towers like experience which in itself is priceless. At the Palace you can imagine in times gone buy kids going to cheaps flicks on a Saturday morning and people queing with anticipation to see the latest form the likes of Clarke Gable, Eroll Flyn. You get the same sense of anticipation from queing outside before the doors open, you get proper cinema ticket stubs from a chrome dispenser. The British have always been good at queuing but it seems that queuing is now to be frowned upon. Parking available in the nearby St Thomas Green Car Park.